I let the pressure and frustration of cancelled meetings and unhelpful conversations get the best of me Monday evening, leading to an email to my advisors back in Newcastle asking for some new ideas. 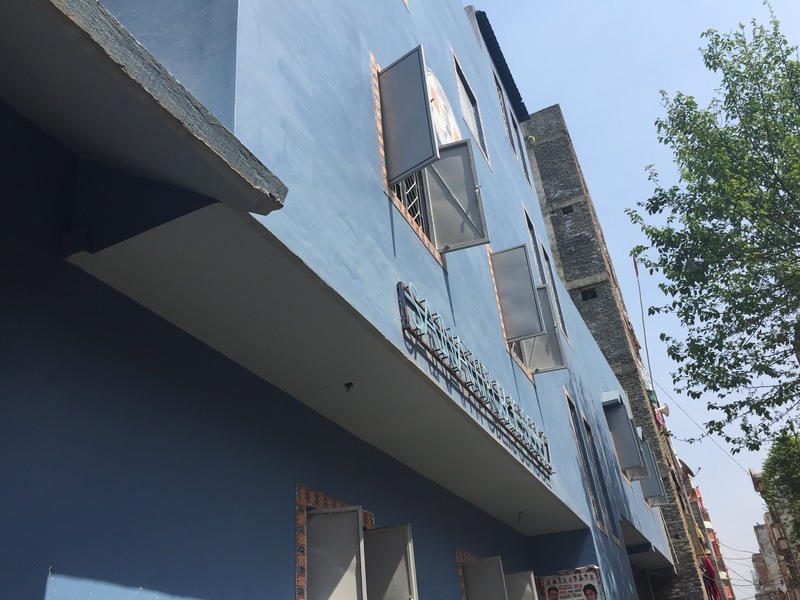 Luckily, they had some great suggestions and one connection gave us contact information for the owner of a low-cost private school in an area of Delhi called Saket. This gentleman also happened to be very involved in NISA, the National Independent Schools Alliance who organized the demonstration with CCS last week. I gave him a call and he has been one of the most helpful and genuine people we have met on this journey so far. We scheduled our meeting for this morning, bright and early. Since his school is also in testing season we couldn’t observe classes, but he invited us to see the facility and meet his teaching staff. We’ll take it! He was even gracious enough to pick us up from the nearest metro stop personally and drive us to the school. It felt really nice to feel welcomed in, especially after all of yesterday’s rejection. We wove in and out of back roads and made our way to the baby blue facade of his school. We entered into a beautiful courtyard where you could see the three levels of classrooms lined with balcony space above us. It was a very warm and welcoming environment. After being ushered into the office and given tea and biscuits we went on a tour of the rest of the school, including the outdoor space they have across the alley from where the classroom building it. The whole facility was more spacious and well cared for than the school I had been in last week. The manager obviously cares for his property and the space well. He told us that his father had started this school after his career in the Indian Airforce. To see the pride he had in the school and to meet the teachers, all of whom seemed to really love their work, was a rewarding experience. After the tour the teachers offered to take our surveys and we got to talk with them briefly. 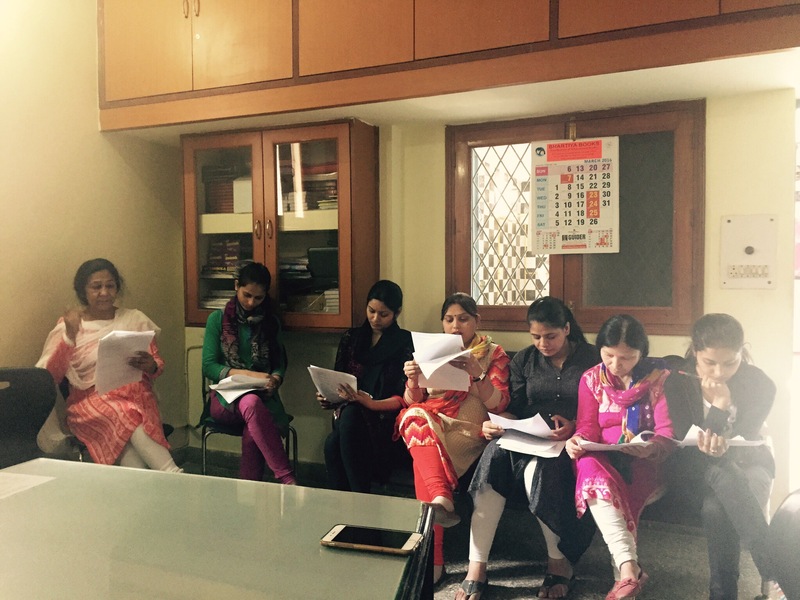 the teachers working on our surveys! We wrapped up in the early afternoon and he was kind enough to ensure we had a guide to get us to a tuk tuk that dropped us back at the metro. We were tired, but wanted to make the most of the afternoon since our time in Delhi is quickly wrapping up! 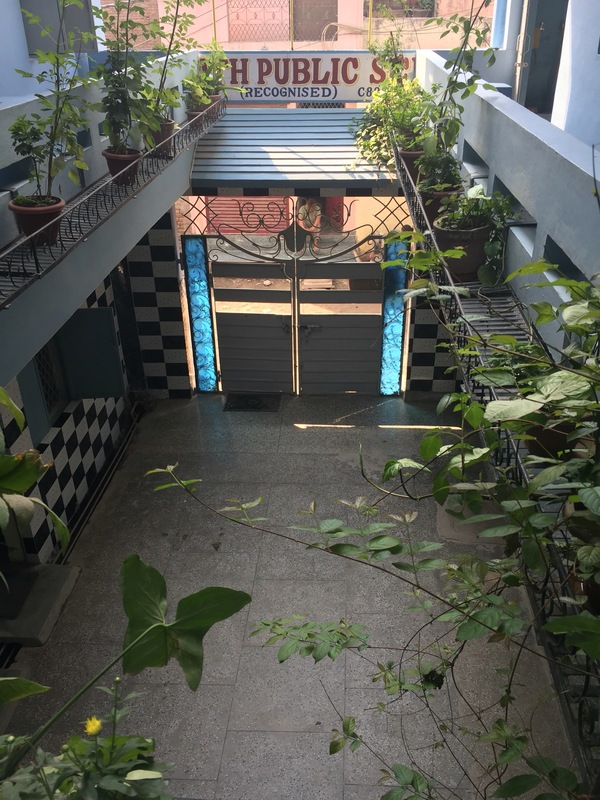 We decided to make our way up to Connaught Place to eat lunch, attempt getting train tickets at the reservation center, and a bit of gift shopping at Cottage Industries which had been recommended to us by Professor Mitra’s wife. We ate at Nando’s and then made our way to the train reservation center. Unfortunately, I’m pretty sure we got sucked right in to the well known con at the station where men stand around outside and point you in the incorrect direction. We quickly got fed up with everyone giving us different information, and since we weren’t that committed to taking the train from Agra back to Delhi this weekend, we decided it wasn’t worth the headache and ended up heading for some retail therapy. Cottage Industries wasn’t really our style, and we were completely drained by this point, but it did have a ton of knick knacks and Steph was able to find a couple gifts for family. We dropped in to the smoothie shop next door before heading for home. This was a last evening together just the four of us so we decided to celebrate with some wine and card games in our rooms. It is amazing how quickly these three weeks went by. I can’t say enough how grateful I am to have shared this experience with these friends. We barely knew other before this experience, but it worked out so well and I feel like we really hit a groove and good group dynamic.